As a kid, I spend many coins on arcade games like Decathlon, Galaga, Centipede and Xevious 2. These games may look simplistic today when you compare them to games produced in the last decade but they were special back in the days. The main reason for that was probably that they introduced a new form of entertainment that got me hooked ever since. 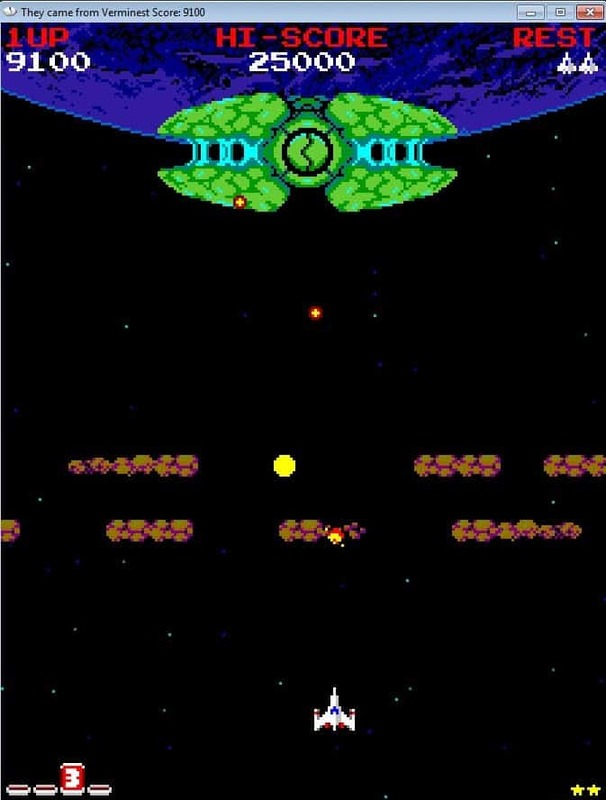 Today's Game Saturday title is Verminest, a retro arcade shooter that combines the setting of Science Fiction movies of the 50s with classic games such as Galaga or Centipede. If you ever played those games you know that all the action took place on a single screen, so no (screen) scrolling involved in this one as well. Before you start the game you may want to run the settings once to make sure everything is set up correctly here. You can modify the keys to control your ship and game related features, and set the resolution you want to play the game in. You control your ship with the cursor keys on your keyboard and fire with Z, and that is all you need to know really to get started. Your ship can move freely in a limited area at the bottom of the screen while the remaining part of the screen is off limits. Enemy ships come in waves that pause at the top in formation for a while before they dive down to attack you. If you get hit, you lose a life. If you lose all life, it is game over. The ships that attack you look and behave different. Some are destroyed when you hit them once, while others do not go down before you have hit them multiple times. You will eventually come upon boss fights that add variety to the game and some excitement as they take longer and are harder to master than the waves you go against usually. 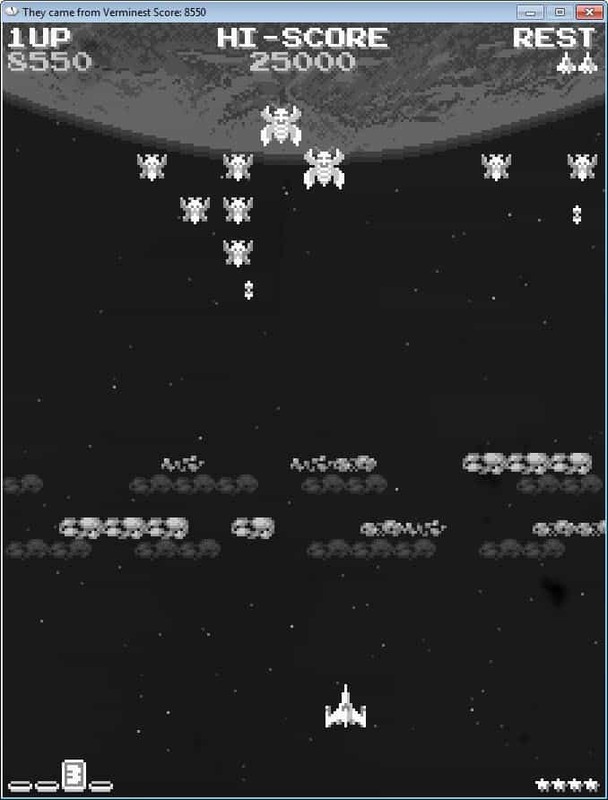 The game comes in a grayscale version or colored version which you are downloaded separately. I personally like the colored version more, it looks like games that I played back on the C-64 in the days. Verminest is a fun game that will keep you entertained for a while. So, if you like classic arcade shooters, want to relive childhood memories or simply play an entertaining game, then Verminest may be something that you should look in to. Verminest is awesome, Locomalito is a Retro plenty of in-game philosopy, recently here in Spain he shocks the retro community with a new work ..MALDITA CASTILLA. If you like to revival a must have title Ghost´n´Goblins, Maldita Castilla is your game. The most amazing work from Locomalito, his brother Jacobo and musician Gryzor87, other recomendation from his library is HYDORAH, another shump with the Nemesis spirit. Amazing election with Verminest!.. thanks for every week section. Yeah Hydorah is awesome, I have reviewed it earlier in this series. Hydorah and Verminest are brilliant. Locomalito has a great touch and eye for detail. Well, detail… those pixels are quite precise!